I finished another hardanger card! 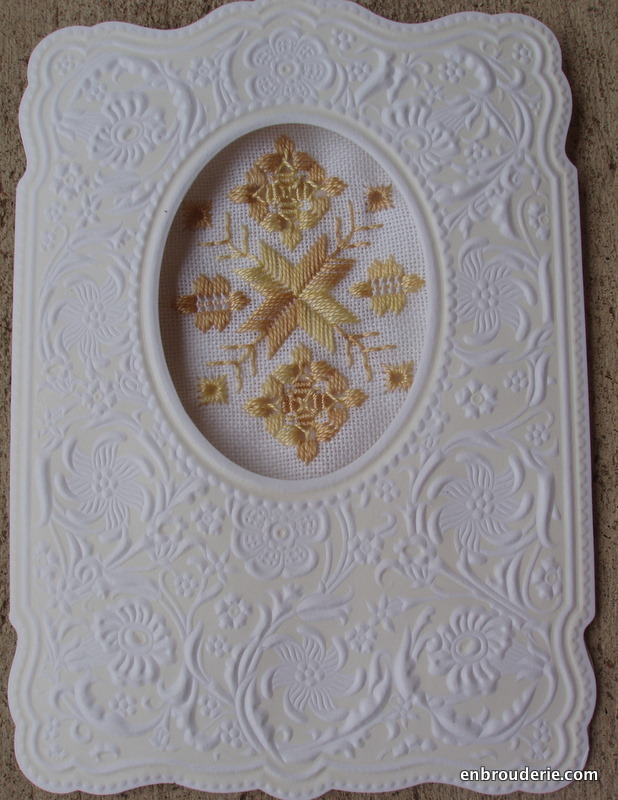 This one is the “June” card – it was originally part of a yearlong series (you can find it here at Nordic Needle). There are a few changes from the original instructions. I miscounted on placing two of the eyelets, so rather than undo them I miscounted the rest to match. I’ve changed up the fillings of the kloster blocks too. Have a closer look! I also gave this a border. These cards are small enough that I don’t die of exasperation before finishing, which makes them good to practice on. I attempted the rolled hem (see the tutorial from Kimberly at Baroque Embellishments) plus some drawn thread work at the top and bottom. Super fancy! Hemstitching is fun! I will say, though, that I had a terrible time turning corners, despite the extra tutorial specifically on how to work corners. I was improving by the fourth corner, but they are still something of an improvised mess. Also, I am not sure if it’s the fabric (32 count linen) or me, but the edges kept trying to fray something awful. There were several points where it nearly frayed to the point where I’d have had to redo the hem closer in. For those interested, here’s a work-in-progress photo before cutting the fabric plus a photo of the back. 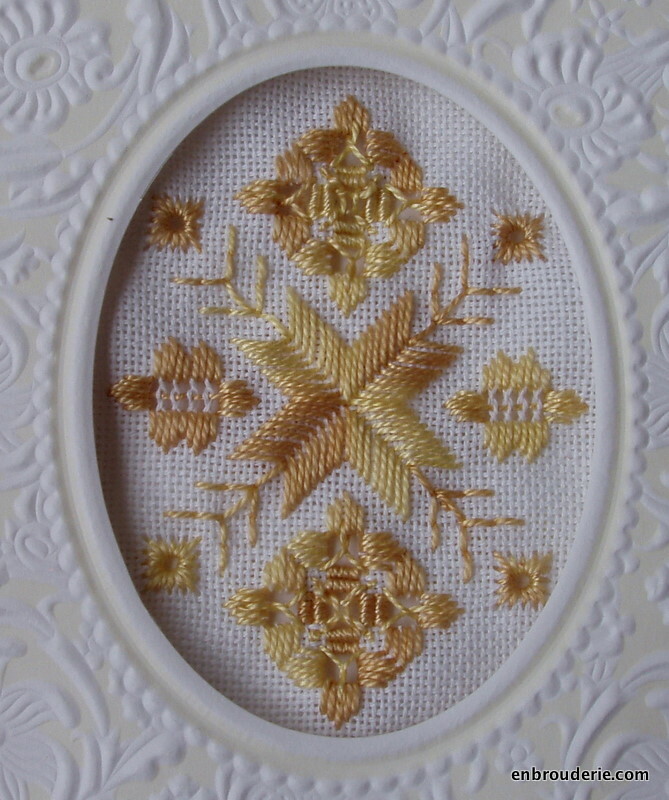 This entry was posted in Drawn thread, Hardanger, My work and tagged drawn thread, embroidery, hardanger, hemstitching, Needlework. Bookmark the permalink. Oh, that’s so exciting! I love it when i give someone ideas! thank you! By the way, you can leave the url box blank when leaving a comment if you don’t have a website 🙂 It’s not required. This is really beautiful!! I love the color combination, I would not think that out by my self!!!! BEAUTIFUL and a nice personal card. I cannot take credit for this color combination – it came with the kit. It’s Crescent Colours Hand Dyed Perle #8 CC008 Ginger Snap. I really love it though! I will have to keep it in mind as an option for future projects. I am not sure I would’ve picked it out myself either. Beautiful! I l love this colour .Is it available in Nordic needle? It helps when we fold the edges and iron it before stitching. Yes, at http://www.nordicneedle.com/prod/CC008-GINGER+SN.html. They also have the same color available in size 8 perle cotton or in floss. It’s a charming piece, Hannah, well done. Hemming corners can be tricky. Sometimes it helps to pin and then tack before you attempt to do the final stitching. I might try that – I was just rolling as I went along. I am enjoying the card series immensely, especially the variety of threads. This is truly lovely, Hannah. 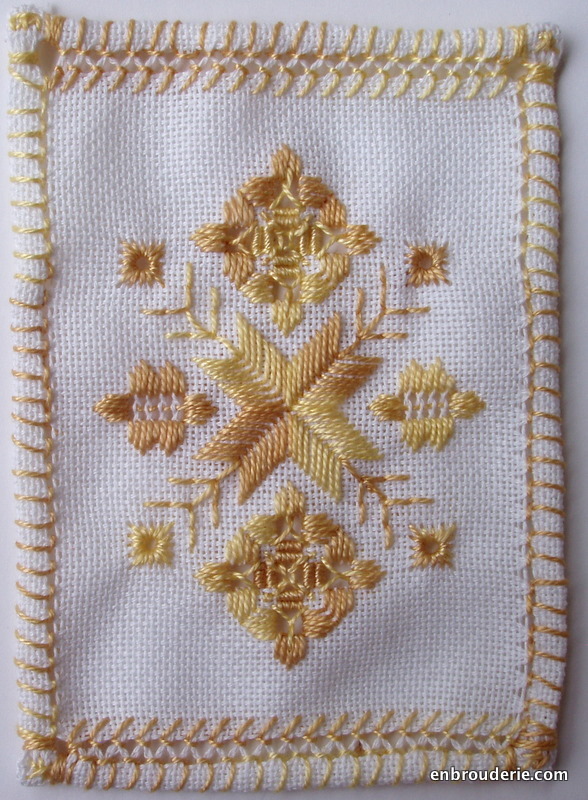 I like your hardanger card.The color you have chosen is lovely.A small suggestion ,instead of the perle cotton thread,if you use three strands of floss it gives a nice sheen and stays flat.I got this idea from an Australian magazine .The thread must be first removed ,strand by strand and put together. I may try that! This perle cotton came with the kit, but I bet floss would look beautiful. Thanks for the idea!